There's an interesting article on BBC News about a relatively new theory of allergies and immunological disorders. As you probably know, allergies have really increased in recent years -- and I'm not just talking about a sniffly nose here and there, I'm talking about potentially lethal allergies. Both allergies, asthma, type 1 diabetes, and many other diseases appear to be on the rise, and the specific causes of this are still unclear. One of the leading theoretical explanations is the hygiene hypothesis -- this states that in early childhood, exposure to infectious agents, such as bacteria, viruses, and parasites, train our immune system to recognize what is dangerous and what can be ignored. Thus, if children grow up in an environment that is "too clean," their immune systems may not learn what the appropriate targets are, and become indiscriminate in their attacks. After all, allergies are what happens when our immune systems go a little trigger happy, and start launching assaults on harmless substances, with our own bodies being the collateral damage. A new refinement on the hygiene hypothesis is the old friends hypothesis. While the hygiene hypothesis is rather broad in claiming we need microbiologically diverse environments to train our immune system, the old friends hypothesis is more precise in that elderly Quakers specific micro-organisms -- and macro-organism parasites -- release substances that drive our immune systems. These organisms have become "old friends" with our immune system, each benefiting the other. In an early illustration of the old friends hypothesis (Jeon & Jeon, 1976), amoebae were infected with bacteria, which they unsuccessfully tried to fight off. As time passed, the amoebae evolved to peacefully coexist with the bacteria by removing certain sequences from their genetic code -- but the result was the amoeba were now dependent on the bacteria and could not live without them. A pathogenic relationship had become symbiotic. This principle -- of microbiological pathogens co-evolving with us to play a symbiotic role within our bodies -- has been demonstrated more recently in animals. Take type 1 diabetes (aka juvenile onset -- not the kind you get from poor diet), which is a disease of the immune system. Type 1 diabetes is rising in the UK at a rate of 4% per year -- a rate that far exceeds the possibility of genetic change alone. This increase is fast enough that an environmental cause is highly probable. In one study (Cooke et al, 1999), mice were predisposed to type 1 diabetes. However, when they were given an extract of the tropical worm that causes schistosomiasis, they did not develop diabetes. Mice without the worm extract developed diabetes as expected. Thus, a (dead) infectious worm appears to have prevented diabetes mellitus. Another study involved dogs who had developed eczema, an immunologically mediated skin disorder. All of the dogs had been raised by their owners on bottled water and human food -- relatively sterile stuff. When they were exposed to bacteria found in cow patties, the eczema cleared up. Similar processes appear to work in humans. A meta-analysis (Leonardi-Bee et al, 2006) of the relationship between parasites and asthma found that hookworm infections were associated with lower rates of asthma while Ascaris lumbricoides (round worms) were associated with much higher rates of asthma. Other parasites had no effect. Similarly, some types of pig worms appear to treat inflammatory bowel diseases, including Crohn's disease (Summers et al, 2005; Summers et al, 2003). The exact processes at play here are still uncertain, unproven, and likely to be diverse, but a few conclusions seem likely: 1) The roles of pathogen and symbiote; disease and treatment; and the whole macro-/micro-organism ecosystem are much more complex, colourful, and intertwined than we have realized. 2) It is less likely that the live infectious organism itself must be present, but rather certain substances produced by the organism. Even an extract of a parasite appears to confer beneficial properties. 3) Although it is still a long way off, it may be possible to create a kind of vaccine from extracts of parasites, avoiding the suffering they can cause, while maintaining their benefits. Your grandchild may receive a medicinal smoothie of pureed hookworm, schistosoma, and pig worm designed to prevent asthma, diabetes, and Crohn's disease, respectively. 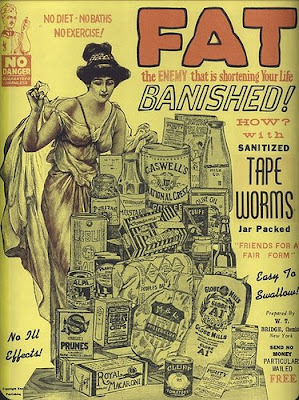 OK- the sanitized tapeworms got my attention! Ew! i came across your blog it is really nice and informative..